Got holes in your trees? It’s not generally good news if you discover holes in the bark of your trees. Common causes of holes in trees include wood boring insects and birds. In the case of insects, it is usually the larval stage that feeds within the tree while the adults feed on leaves or other external tissues. 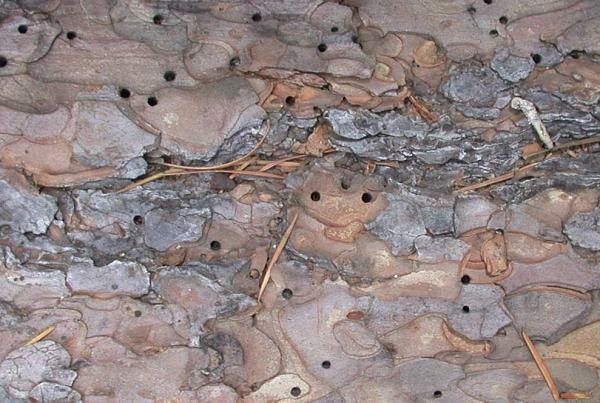 In spite of this, it is most often the adult stage that created holes in the bark. These may be either entry holes caused by adult beetles entering the tree to lay eggs or exit holes created when mature beetles or moths emerge following pupation. Bark beetles are very small, often just a few millimeters long in the adult stage. A typical life cycle would go as follows: Adult beetles mate and females bore through the bark of host trees, leaving a tiny round entry hole. Once below the bark, she excavates a parent gallery and lays eggs in niches along its length. When the larvae hatch they tunnel outward in a pattern (gallery) characteristic of that species which can aid in identification. They feed on the living cambium layer between the bark and the wood and when the cambium layer is killed all the way around the tree no new conductive tissue is produced for movement of water and nutrients in the tree and the tree dies. Once the larvae mature, they pupate in their galleries and emerge as adults through new exit holes in the bark. Bark beetles are often attracted to trees stressed or weakened by other agents such as drought stress or other pests and diseases. In addition, some species emit an aggregation pheromone from an attractive host tree that attracts many more bark beetles of that species. When many entry and exit holes occur together it looks like shotholes and there are certain bark beetles that are known as shothole borers. Some bark beetles carry fungal spores on their bodies and when they create their parental/egg laying gallery, the fungal spores are introduced into the host tree where the fungus can develop in the wood. These fungi may or may not have a direct impact on tree health and the fungus is sometimes a source of food for the larval insects. D-shaped emerald ash borer exit hole (PA Dept. of Cons. & Nat. Res. – Bugwood.org, larval galleries of the emerald ash borer (wikipedia). D- shaped or oval exit holes are typical of Buprestid beetles including the emerald ash borer (D-shaped). Common names of beetles in this group include metallic wood boring beetles or flat-headed borers. There are over 15,000 species and some have brilliantly colored metallic looking elytra (wing covers). Holes are relative to the size of the beetles which are small to medium in size. The D-shaped exit hole of the emerald ash borer is about 4-5mm across and the beetle is just under ½” long. Asian longhorned beetle exit hole and adult beetle. (US Forest Service photos). Round exit holes that are larger than those of the bark beetles are created by round-headed or longhorned beetles as they exit trees (family Cerambycidae). In this family, eggs are often laid singly in the bark and newly hatched larvae tunnel into the wood to feed until they pupate and emerge as adults. The Asian longhorned beetle falls into this group and the emergence holes are deeper than those of many other similar beetles. Pupation of the Asian longhorned beetle occurs not far below the bark but these larvae tunnel throughout both the heartwood and sapwood of the tree. Because of this, they tunnel out toward the bark to pupate, creating a tunnel from deeper in the tree. There are a number of native longhorned and other beetles that created similar exit holes. If you are concerned that you may have a tree infested by Asian longhorned beetles be sure to contact the plant diagnostic lab in your state (at your state’s land grant university of state agricultural experiment station) for a definite identification. Some borers create somewhat longitudinal or horizontal scars on the surface of woody stems and branches. Examples are the rhododendron borer and the sugar maple borer. Rhododendrons may be attacked by two types of borer. The rhododendron borer is the larva of a clear-winged moth while the rhododendron stem borer is a longhorned beetle. Evidence of damage begins as wilted then dying shoots and stems. Woodpecker damage, left. J. Allen photo. At least two types of bird create holes in the bark of trees to access food. Woodpeckers create large, irregular and rough-edged holes as they peck away at the bark to get to insects, including borers underneath. Sapsuckers also peck holes in trees but they are smaller, uniform in size, round and often occur in rows or grids of multiple feeding sites. As their name implies, sapsuckers feed on tree sap, not insects. A final interesting cause of holes in sugar maple. Taps used for extracting sap for maple syrup production can also create round holes in that type of tree and they look very much like the exit holes of some of the larger wood boring beetles!